Once upon a time, I dreamed of an old house full of plants, color, and funky secondhand furnishings. Then I found a husband and was persuaded to buy a very traditional 1940’s Colonial in the suburbs. It was someone’s dream house, but it wasn’t mine. Before I knew it, I was shopping at Banana Republic and living in a Pottery Barn catalog. Blech! Then I left all of that and moved to Denmark where I found the ultimate vintage flat. Unless it came with a gas stove, and a clawfoot bathtub instead of a shower, it couldn’t have been more perfect if it was built especially for me. For a little over a year, I tried to love my light, neutral walls. I tried to convince myself that it would be easier to resell if I fell in line with the Scandinavian norm and kept the walls neutral and light. But I soon realized that I was living in an Ikea catalog and I didn’t like that any more than I liked living in a Pottery Barn catalog. And so, I dipped my toe into the color pool. My design advisor tried to guide me toward a lesser commitment, “maybe white with lavender undertones,” he’d said. But I’d sold out before. The list of compromises went on and on until I wondered why I was even paying the mortgage. Screw that, there’s no compromising this time! My best decisions are the ones where I trust my gut. When I pick a direction and go, without second guessing, without over-analyzing. I’m definitely thinking about a new floor, black and white tile, or maybe aged hardwood to match the rest. There will be more color in the other rooms. I’m thinking red in the bathroom, deep pink in the bedroom, and who knows what in the other rooms! 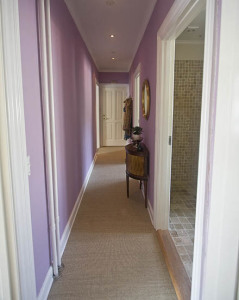 I had a purple (very deep) bathroom and I loved it. Not everyone did, but I did! I think that look awesome, it adds so much! i LOVE colors! Gasps for air! 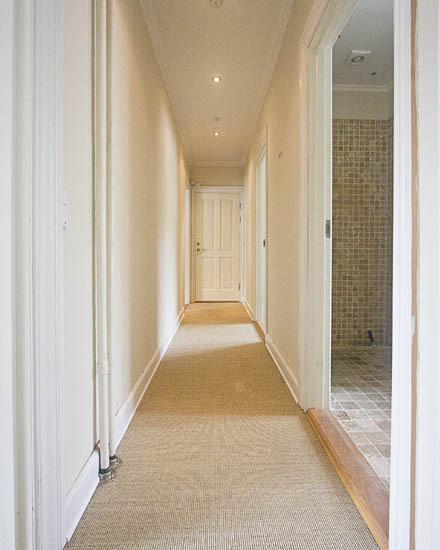 But then again, I’m Danish and love white, neutral and airy light rooms. Good for you to turn your home into YOURS! I love neutral spaces in other people’s homes, I marvel at how airy and uncluttered it looks, but in my house, it always feels like I’m house sitting. And it was so difficult to find the right shade of purple here. One trip to the paint store, and it was obvious that I now live in neutral country…lol! I love it!! Love the color but most of all I love your courage! Absolutely lovely! What a beautiful color! I myself love color. I know when I go to sell my home the person who buys my home may most likely hate my terra cotta living room with it’s olive green ceiling, my fall leaf orange dining room with it’s bronze ceiling and my dark green kitchen with it’s lighter green ceilings. Feel free to paint it any color you wish when it’s yours. I won’t be insulted. Isn’t the color pool wonderful! Purple is my favorite color! Looks awesome. What a beautiful shade of purple. 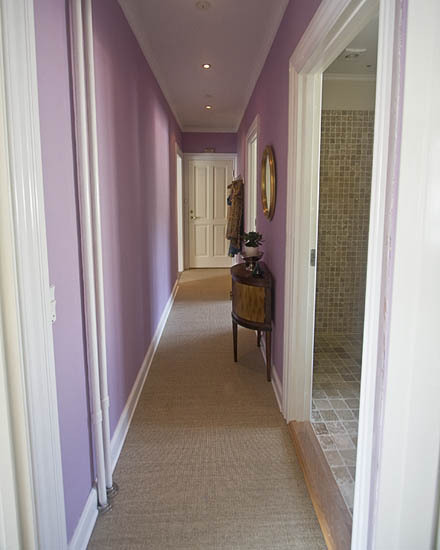 I never would have thought to use any purple tone in a hallway (and I love color) in a hallway, but that is gorgeous and welcoming! I love it, Sage. And heck with the norm wherever you live. It’s your house, your home. It should reflect you. Looks great! I am currently thankful for all the white walls, if only because the previous two places we lived had rooms of obnoxious colors and patterns which we were not allowed to change! Once all of our neutral/white Ikea stuff arrives, I am sure I will be scouring the thrift stores for pops of color!!! I painted the kitchen leaf green and the bath Tiffany blue. In a rental. My neighbors were puzzled and then began to admire my bold design statement. Danes are progressive in many areas but paint is not one of them. How about the cost ;) $20 for less than a litre of Bilka’s stock paint. Ouch! Beautiful color! SOOOOO “UnDanish” and I FREAKING LOVE IT!!!!!!! Who cares what others think, as you said…its just paint and can be undone. Should the time come for you to sell your home…you can repaint with a neutral right? I love it! Funny I was thinking of painting my kitchen purple. I just havent quite found the right shade…….but I do love yours.